Intelligent Light, makers of the FieldView CFD visualization and postprocessing software, will be developing technologies to bring simulation technology to small and medium-sized businesses. This work will be funded by a Small Business Innovation Research (SBIR) Phase 1 contract from the Department of Energy. [The delightfully named] FRIENDSHIP-Framework now has a community forum for comments and questions about this software for design studies and shape optimization for CFD. The latest for mobile CAD viewing is vueCAD, available for free on iOS. The app supports a wide variety of geometry formats including IGES, STL, SolidEdge and many more. Visualization using Tecplot helps identify sources of wind turbine noise. 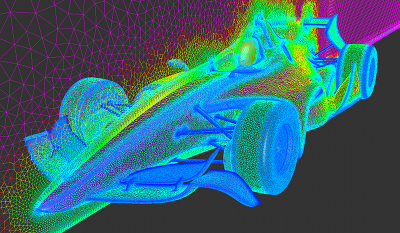 There’s a nice preview of CFD and the 2012 Formula 1 season on the Cascade Technologies blog. Beta CAE released ANSA v13.2.2. Abstracts for TFAWS 2012, Thermal & Fluids Analysis Workshop to be held 13-17 August at JPL, are due by 18 May. All the presentations from SolidWorks World are now available online. Kahmsin v0.7, a plugin for Google SketchUp that facilitates running CFD analyses, was released. It’s interesting to me that the 2 answers so far both involve aspects of dealing with geometry which is probably what my answer would involve. Join this group and tell us what you’d like solved. This hybrid mesh for an open-wheel race car was generated using Pointwise's T-Rex technique. Version 17.0 of the Pointwise CFD mesh generation software was released. The two biggest features in this major release are an advanced implementation of the T-Rex technique for the highly automated generation of hybrid meshes for viscous flows and native CAD readers for ACIS, CATIA V4, CATIA V5, NX, Parasolid, SolidWorks, and STEP. A 3-part series of weekly webinars will introduce various aspects of the Pointwise meshing software with the first scheduled for 28 March. This entry was posted in Applications, Events, News, Software and tagged FIeldView, FRIENDSHIP-Framework, Intelligent Light, ONERA, Pointwise, Tecplot, TFAWS, vueCAD. Bookmark the permalink. Sorry that there’s no CFD picture in that article. But the article does discuss why CFD is so important to F-1 teams and the parts of the cars that can most benefit from CFD for improved aero performance. John, Congrats to you and your team on the release of PW 17.0! !